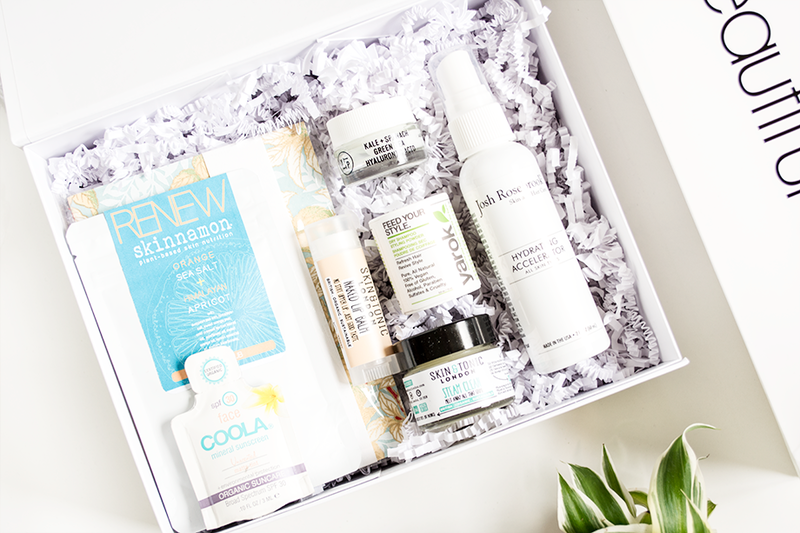 Earlier this week, one of my favourite eco-luxe beauty boxes from abeautifulworld was released so (of course) I had to set my alarm early to order one! If you've been reading my blog for a while, you'll know I always love these limited edition boxes! They're only released twice a year and sell out quickly, containing a selection of their best performing organic and natural beauty products. The box is white this time instead of the usual pink and it's perfect to re-use for storage. I'm so pleased with the contents - they're all items I haven't tried before and would have happily picked for myself! The sample products included in my box: Skinnamon Renew Body Scrub, Coola Mineral Face Matte-Tint Unscented SPF30, Skin & Tonic Steam Clean and Naked Lip Balm, Youth To The People Age Prevention Cream, Yarok Feed Your Style Dry Shampoo, Josh Rosebrook Hydrating Accelerator and, as an added bonus, a gorgeous little notebook from Esmie. I'm really looking forward to trying all of these products but, since I already love Yarok, I think I'm most excited to try their dry shampoo (which is one of the cutest little samples ever by the way)! I also can't wait to finally try Skin & Tonic as I've been meaning to test out their products ever since they first launched. The value of the box as a whole is great and there's a 10% off discount code included too. As these boxes are limited edition, they have already sold out so unfortunately you won't be able to get your hands on one now, but make sure you follow abw on Twitter or join their waitlist for the next A/W box which will be available in October.